To encourage businesses to use applications from the Windows Store, Microsoft will launch an enterprise-specific app store when Windows 10 goes live this summer. Windows Store for Business will support business payment methods and enable schools and companies to customize the Windows Store to highlight and browse products in a more streamlined fashion. 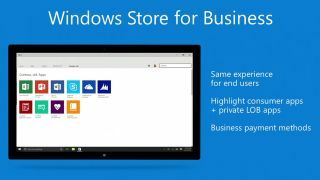 Originally mentioned by Microsoft in September, Windows Store for Business is designed to be more manageable for IT departments and business decision-makers. The web-based Store portal allows organizations to browse the Windows Store app to catalog and acquire apps in bulk. Organizations will be able to create own private sections of the Windows Store that houses pre-selected custom apps. IT administrators can assign apps to people in the organization, who will be directed to the downloads via an emailed link. Additionally, within this private section of the Store, employees can scroll through to download apps that have been pre-approved by the IT department and management teams. Users will sign in via the Azure Active Directory.